The Short Version: Christan Marashio shares her perspective as a single woman in today’s dating scene on her blog, And That’s Why You’re Single. She answers common dating questions, sent to her by readers, in thoughtful and blunt articles about everything from what makes a good dating profile to how to find fulfillment in the single lifestyle. Additionally, through Buffs and Brainiacs, the dating blogger organizes engaging events in New York City and Boston to help relationship-oriented singles meet in person. Whether she’s lambasting poor dating etiquette or supporting a healthy mindset about being single, Christan always tells it like it is and motivates daters to improve their dating habits in meaningful and lasting ways. As a well-known dating blogger, Christan Marashio often receives letters asking for advice. Many singles out there encounter difficulties, feel alone in their dating woes, and want to know what they’re doing wrong. Every week, Christan uses the letters in her inbox as inspiration for the content on her blog, And That’s Why You’re Single. Sometimes the stories even inspire her. One woman wrote that she knew what she wanted in a partner — but she was having trouble finding it. She didn’t want to settle for someone who didn’t love to travel, like she did, or didn’t share the same values she did. Throughout the letter, it seemed to Christan that the woman was looking for permission to make dating less of a priority. It sounded like she was ready to move on to more fulfilling parts of her life and not worry about going out to bars, setting up dating profiles, and spending time feeling like she was lacking. The single woman didn’t feel like anything was missing. She enjoyed her life as it was. Christan Marashio, a popular dating blogger, relates her own experiences with dating when giving out advice. The woman’s words resonated with Christan, who’d just lost her father and begun re-evaluating her own priorities. With her grief came a sense of independence because she was freed from the weight of her father’s expectations. She didn’t have to worry that her single lifestyle disappointed him. She only had to ask herself if her life satisfied her own values and expectations. And, she realized, it did. So she told her reader to travel the world, forget settling down, and let her love of life be the love of her life. Christan doesn’t claim to be a miracle worker in the dating world. She just calls it like she sees it. Her authenticity draws readers to her advice and lends weight to her opinions. And That’s Why You’re Single offers the experienced and humble guidance of someone who’s been there, done that. Anyone over the age of 23 can submit a dating question to Christan online. 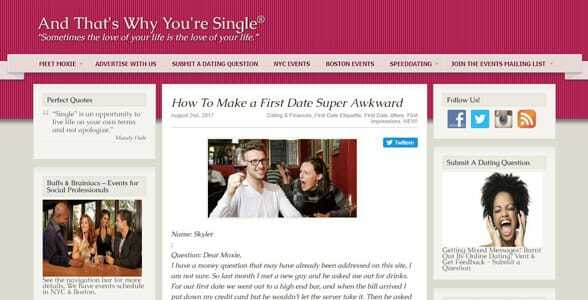 She posts these letters on her site and answers the salient issues impacting daters from what to say on a first date to which dating site to join. When the writer answers a reader’s letter, she breaks down the dynamics of the dating situation with enlightening detail. Her articles balance informative content with a casual and lighthearted tone. In “Spoiler Alert: He Just Wants to Get Laid,” Christan talks about how women can tell when a man is just buttering them up because they want to hit it and quit it. She cited a reader’s letter describing a man’s ‘we’ talk and an atypical level of interest before the date was even over as the tell-tale signs of a player. Often, she takes a feminist stance on dating issues and encourages her female readers to deal with men on an equal footing. And, of course, to give themselves permission to be happy on their own. Christan told us her strongest asset as a blogger is her objectivity. When she reads about another person’s dating troubles, she can assess what’s going on and answer their questions with a fair-minded point of view. 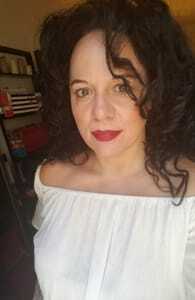 Her experience in the dating arena helps her spot common mistakes (sometimes ones she herself has made) and give down-to-earth tips or emotional support to her readers. Christan gets to the point in short articles peppered with empathetic guidance and snarky commentary. And That’s Why You’re Single typically comes out with two posts a week — one in answer to a letter and the second relating to a personal issue that’s on her mind. Over the years, Christan has written over 2,000 articles about dating and relationships. In her blog, Christan answers reader questions about online dating, understanding men, date etiquette, and other important issues to singles. As part of her writing style, Christan weaves in her own personal experiences, musings, and opinions about dating. She is passionate about giving clear and honest answers to her readers because she understands the struggles of being single. She relates to her readers on a deeply personal level. In addition to her blog, Christan has been hard at work writing a novel for the past few years. The intriguing synopsis reads, “An emotionally fractured woman is forced to trust the man responsible for her unraveling in order to save the one thing keeping her from falling apart again.” It’s like “Devil Meets Prada” meets “Girl, Interrupted.” The story of love and betrayal is about a woman’s journey to heal her broken heart and find love again. This subject is deeply personal to the blogger because she hears so many stories from singles around the world trying to cope with the fears and insecurities of being alone. In her writing, Christan hopes to bring clarity and compassion to emotional dating problems. While Christan is more than happy to talk through dating issues on her blog, she also realizes some singles need more than words. So she hosts events to help them get out there and make things happen for themselves. 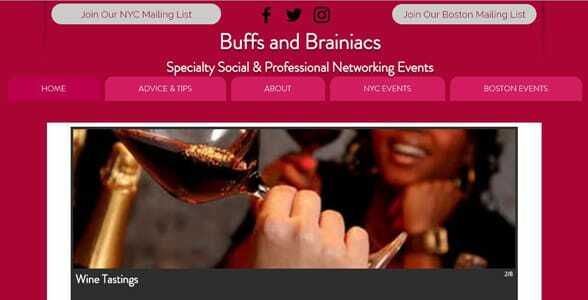 Buffs and Brainiacs arranges singles parties, speed-dating nights, and other social events in New York City and Boston. Typically, social event company hosts about 40 to 50 niche events per month for singles and non-singles. Each event has a particular theme to appeal to like-minded daters looking to connect based on personality over looks. Christan actually goes to many of the events because she enjoys the casual social atmosphere. She told us the events are always a lot of fun, especially the activity-based ones. A popular trivia night or intellectual debate can really get people’s juices flowing and encourage singles to go beyond small talk when getting to know one another. Buffs and Brainiacs specializes in organizing social events for singles who like to mix things up. Whether you enjoy exploring new places on a scavenger hunt or rubbing elbows at a wine tasting, the Buffs and Brainiacs events help singles and couples network with people who have similar hobbies and interests. After a heartbreaking divorce, Chloe felt pretty low about her dating prospects. She was a single mom living in London and feeling overwhelmed by the dating scene. Her fear of being alone made her feel desperate and hopeless — until she came upon And That’s Why You’re Single. Chloe felt particularly moved by an article about making peace with the idea of being single and finding joy no matter your relationship status. In reading Christan’s veritable treasure trove of articles, it’s clear that she gets it. She empathizes with the single lifestyle because it’s part of her life experience. Underneath her blunt attitude is a real passion for helping her readers grow their confidence levels and learn how to become savvy daters. Christan believes the journey, not the destination, is where singles should focus their energy and attention. Her supportive advice empowers many readers to put themselves out there and navigate the challenges of today’s dating world. Sometimes her blog even inspires singles, like the woman who loves to travel, to give themselves permission to live the way they want. Because she’s out there dating right alongside her readership, Christan can offer an insider’s perspective on what it’s like to face rejection, have a bad date, and feel insecure. And That’s Why You’re Single stands in solidarity with the modern single dater.